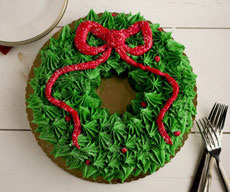 You may not feel up to making a Bûche de Noël (Yule Log Cake), but you can certainly make a wreath cake. While there is trend to pull-apart cupcake wreath cakes, we decided to try a traditional one. This recipe was adapted by Audra, The Baker Chick from one on AllRecipes.com. It’s the third photo, requires no piping skills, and although it’s not as showy, it’s much easier to serve and eat. Prep time is 15 minutes, bake time is 50 minutes. 1. PREHEAT the oven to 350°F. Spray or grease a 10-inch ring pan thoroughly‡. 2. COMBINE the half stick of butter, 3/4 cup white sugar, cinnamon and 1 teaspoon of vanilla in a medium saucepan over medium heat. Stir until the butter has melted; then add the cranberries, tossing until they are coated in the butter mixture. Pour into the bottom of the cake pan and set aside. 3. CREAM together the 6 tablespoons of butter with the remaining ½ cup of white sugar and the brown sugar in a large mixing bowl fitted with a paddle attachment. Add the eggs, one at a time, the rest of the vanilla and the buttermilk. 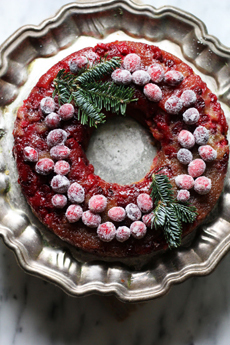 TOP PHOTO: A professional wreath cake from Frederick’s Pastry. MIDDLE PHOTO: A wreath of cupcakes from BeautifulLife.info. BOTTOM PHOTO: An easier-to-make wreath cake from TheBakerChick.com. 4. WHISK together the dry ingredients and slowly add to the butter mixture, mixing on low speed until well combined. Pour/scoop the batter over the cranberry mixture and use the back of a spoon to smooth as needed. 5. BAKE for 35-50 minutes, depending on your oven, or until a toothpick inserted into the center comes out clean. 6. MAKE the frosted grapes. Garnish before serving. *If you don’t have buttermilk, add 1 or 2 tablespoons of lemon juice or vinegar to enough milk to make 1 cup. †Fresh evergreen can impart strong sap or needles. ‡There is not enough batter to fully fill out a bundt pan.